„Quality from the start!" is our guiding principle. our own method of peat extraction is the upper and subfield process with best conditions for mire reconstruction. our own peat extraction is taking place only in Northern Germany in compliance with strict environmentally relevant criteria. ... because peat is still essential and the targeted peat reduction can only be implemented taking into account the crop safety. peat reduction in the sense of CO2-saving and conservation of resources is an important business objective. also the renewable resources wood fibre (own wood fibre processing) and cocos (own processing) are in our own hands. our own consultants are in direct contact with the customers. ... which are honest and down-to-earth. Organic Nutrients for a strong plant growth. Alternative organic and regional constituents for a natural and healthy plant production. Holistic soil concept with natural growing media constituents and biological nutrients for ecological gardening. Establishment of a non-profit Foundation for the purpose of restoration and conservation of peatlands. Thoughtful development of the working environment taking into account ecological, health and social criteria. „As medium sized family-owned company it is a matter of course that we manage with responsibility and with a focus on the coming generation. On the occasion of our centennial anniversary in 2008 we started a conscious process of reflecting the topic of sustainability on all enterprise levels and push it forward. With our initiative NATUR PUR we would like to show how and where we are taking on responsibility and how we can inspire others with our enthusiasm. More sustainability is necessary and it even is fun." This is the message Josef Gramann, Managing Director of the Northern German soil producer Gramoflor and his team is promoting. And they are serious about it. In dealing with challenges such as climate change, natural and ecological destruction, shortening of resources and a dramatic loss of biological variety horticulture and agriculture are playing a major role. Especially here is the short-term, on growth and profit focused subsistence strategy clearly noticeable. The time for an awareness change also in horticulture has come as seen in the rising debate with the subject sustainability on all levels. With the initiative for more sustainability and ecological growth, Gramoflor wants to reflect with transparency and understandability its social, ecological and economic working standards. The holistic approach of Gramoflor shows concrete results: Innovative natural growing media constituents and organic nutrients based on renewable regional raw material such as LIGNOFIBRE® and MO•COMBI® and the concept of high quality living soils such as BIO Kräuter- & Gemüseerde. All new products are approved for organic farming by EC organic standard No 889/2008. The company further focuses on a healthy and excellent working condition for its staff and the active protection of nature and environment. With its own peat extraction the company Gramoflor clearly declares itself to the base in Northern Germany. They are concentrating on the restoration of the Northern German mires. To ensure the successful development of degraded peatland to ecologically valuable natural landscapes such as living mires and valuable biotopes rich in species for coming generations, the company founded the non-profit civil law foundation Lebensraum Moor ("Foundation Mire Habitat") in 2012. The foundations primary concern is to contribute to a respectful and responsible approach to nature and intends the promotion of the conservation of mire and nature, the ecological education and research and development. Nearly 90% of our peat is extracted from agriculturally used peat deposits in Northern Germany which are drained and degraded already. Due to mineralization these areas lose at least 1-2 cm of peat every year. Valuable resources that release unused into the atmosphere and cause significant emissions of greenhouse gases like CO2 from German peatlands. How is the peat produced? The peat is produced in strict compliance with the accredited practice of the Lower Saxony Mire Conservation Program. In planning for site preparation and peat extraction precautions are made from the start to ensure that the establishment of valuable peat moss and the development of living mires is possible after use. Former agriculturally used peat deposits are developed, far beyond legal requirements, to ecologically valuable natural landscapes as there are living mire habitats and species-rich biotopes. The company describes the ethical, social and ecological core principles according to which it alligns its future conduct. The first ecological substrates are developed. Today Gramoflor produces and distributes about 18 ecological substrates and potting soils under the EC organic standard (FiBL Germany, FiBL Switzerland, InfoXgen Austria). 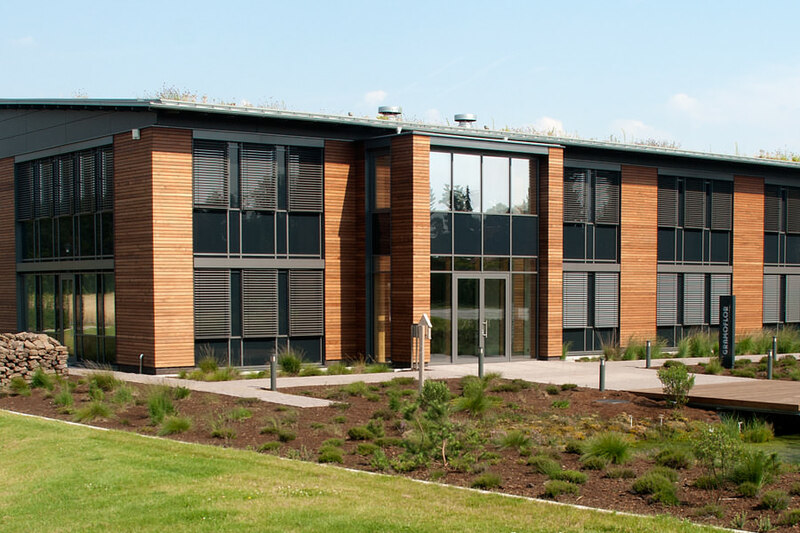 The company's office in Vechta is built in due consideration of ecological, health and social criteria. The building comes up to the high standards of the RAL Quality Assurance Association and is awarded be the CO2 Bank as an Active Contribution to Climate Protection. An R&D department is established with the aim to investigate and develop safe alternative growing media constituents based on renewable resources, to support the use of organic plant tonics and to develop innovative and comprehensive product solutions of a high quality and functionality. Among other, one focus is on sphagnum (peat moss) cultivation. At the production site in Vechta a modern greenhouse from energy efficient double foil is built (energy saving: 40 %). Gramoflor takes over the first official mentorship of the Nature Protection and Information Center Goldenstedt (NIZ) in Northern Germany. A non-profit foundation "Stiftung Lebensraum Moor" is established to promote mire and nature conservation, ecological knowledge as well as research & development. High quality and natural growing media constituents such as the ecological wood fribre LIGNOFIBRE and the 100% biological nutrient complex MO·COMBI are launched. Approved for organic farming. Based on regional resources a 100% natural soil is developed for healthy kitchen herbs and vegetables. Approved organic quality for the specialized trade! Due to the rising demand for organic products a BIO Blumenerde (organic soil) was added into the product range. It is peat reduced and available in three packaging sizes. Additionally the so called "efficient recipes" moved into the Gramoflor standard professional line. They offer the already familiar Gramoflor quality promise and a preservation of resources (ecology) of the raw material peat as well as a price advantage (economy). The share in wood fibre LIGNIFIBRE is a minimum of 20%. Just in time for the start of the season the complete Gramoflor potting soil range is presented in a new contemporary design and the recipes meet the challenges of a responsibly produced potting soil. The peat share was reduced und replaced by renewable raw materials such as woof fibre and spelt husks.